Empowering tour operators with intelligent waiver solutions that streamline your arrival process and activate your marketing potential. By going paperless you get more than just a signature. Still spending money printing, stacking and storing your guest waivers? Up your game and go paperless by securing your information in the Cloud that can be accessed in seconds. By switching to a digital waiver solution you can free up valuable staff time by removing the need for manual data entry. Wherewolf sends all your customer information to your online database within seconds. Move beyond clipboards and make a great first impression with a beautifully branded and simple to use iPad check-in app, making your check-in process even quicker. Digital waivers allow you to execute brilliant marketing strategies by gaining more powerful insights from your guest data, all in a few mouse clicks. The pre-arrival waiver allows you to capture everything you need from individuals, groups and even parent or guardian signatures – all linked to their booking, ready for when they arrive. Collecting guest waivers before arrival allows greater data collection without increasing check-in queues. Make a great first impression with a custom-branded app designed for you. Whether alone, or in groups, enhance your guests experience with a user-friendly app that asks everything you need to know, in seconds – whether offline or online. Take your daily guest view further by creating custom trip manifests to see which guests are on which trip, when, with what staff and what equipment. Make life easy for staff to view numbers, medical information and other customer data. Connect with your guests after their visit by sending a custom-branded email that encourages feedback and online reviews. Grow your social media following and increase online engagement by linking to TripAdvisor, Facebook, Google or Instagram. No need for third party email providers. We empower you with complete visibility across your business. Our filterable graphs provide detailed analysis of every aspect for greater insights and smarter business decisions.We become your customer database that helps you grow. Wherewolf is so much more than your standard digital waiver software. Wherewolf connects seamlessly with the software your business already uses. Small family run businesses, to large franchise companies, use Wherewolf to improve their customer experience. Read our customer reviews. Find out how Missing Pieces Escape Games plans to grow their customer experience and gain more data insights. Boost your efficiency like Balloon Aloft, read how they lift 12,000+ guests off the ground ASAP with Wherewolf. 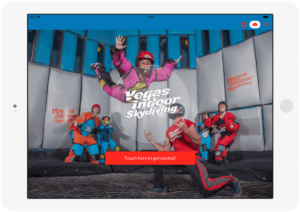 Find out how Glacier Rafting Company ditched their paper waivers for iPads, getting their customers to their adventure quicker! By using Wherewolf’s check-in function, Charge About Electric Bikes has freed up time for staff to work on essential operational tasks. Read our interview with Professional Helicopter Services to hear their reasons for adopting a digital check-in/waiver platform. Great Product - My customers love the unique checkin and it makes our front desk and vans look slick!! Fantastic idea and great systems – it has changed the way we look at gathering customer information for the better moving forward. Its been a game changer for our Tours and I feel has been a key part in helping us jump ahead of our other competitors for sure.